Goodreads: When newly widowed Elsie is sent to see out her pregnancy at her late husband's crumbling country estate, The Bridge, what greets her is far from the life of wealth and privilege she was expecting . . .
Kritters Thoughts: An interesting gothic mystery book that from the beginning made me slow my reading down and read with an attention to detail. With two storylines featured, with the same character at the center. In one storyline Elsie is a young pregnant widow and is moving into her deceased husband's home and is going to try to put the pieces back together. In the other main storyline, Elsie is older and a fire has just happened and she is in a mental hospital and can't figure out what happened. There are other chapters that at the beginning confused me completely, but these are from a Bainbridge relative from the distant past. Let me start by saying I was completely confused for this first portion of this book and it took me two tries to get into it and to really understand what the heck was going on. It was the other viewpoint that really threw me off because after my first try I read a few reviews and couldn't place where this was coming from. In the end I loved its inclusion, but it had me pondering for the beginning. I kind of wish the author had waited and introduced that storyline after the reader is familiar with the other two Elsie storylines a little better. I don't read a lot of historical fiction mystery/thrillers, so this was both in and out of my familiar reading. 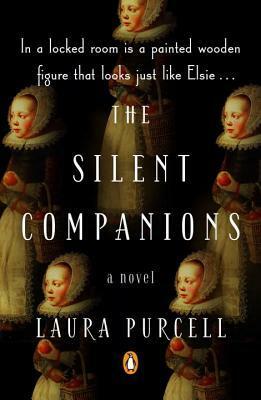 It was interesting to combine the elements of a historical fiction with a creepy mystery thriller addition. It was extra because the timing of the story was so far back so the element of mystery was specific to that time and just felt different from what I normally read and I both liked it and had a hard time getting into it. If you read a lot of Victorian fiction whether it is mystery/thriller or just fiction, you would probably like this more than I did. If you read mystery/thriller and you feel like each one is feeling the same and the same, this could be something that is out of left field that you could enjoy. Disclosure of Material Connection: I received one copy of this book free of charge from Viking. I was not required to write a positive review in exchange for receipt of the book; rather, the opinions expressed in this review are my own.